If you know me, you know that I LOVE me some Sr. Wooly. 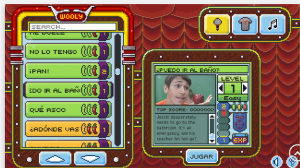 The why is easy–the songs and videos are fun, comprehensible stories that engage students and help them acquire language. But the HOW could be a different matter. What do you DO with the songs? That is a loaded question. Loaded, because there is no right answer. There is no wrong answer. There are just a LOT of things you can do with any given song, so putting too much stock in what I do could lead you to believe that your ideas aren’t correct. PLEASE, do NOT take this as THE way to use a song. There is no magic to my order or flow. I have just been using this stuff long enough that I can see how things will/may flow in a logical way. This is just how I am currently picturing me doing this. Heck, this isn’t even how I *am* doing it. I’m writing this in the middle of July! But here is how I would approach the story/song. A bit of my context first. I teach levels 1-AP Literature. And I do it on 90-minute blocks. As I describe my plans, I’m going to write about 10-30 minutes of activities as a whole day. If you’re on a 45-minute period, you may not want (or be able) to devote that much time on any given day to Sr. Wooly. And that is okay. We won’t tell Jim that his site isn’t your everything. It can be our little secret. According to a completely non-scientific poll on the Woology facebook group, this is the first song many teachers use. So, it’s a great way to show how I teach a song. Hopefully this helps you get ideas at the start of the year. I always check out the supplementary packet. 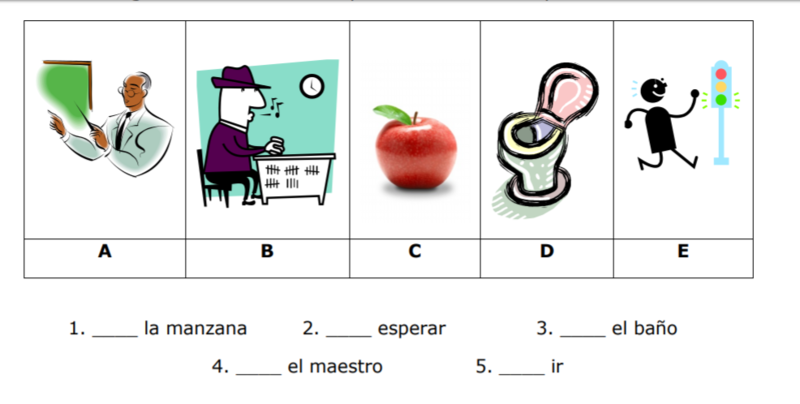 While I don’t always use the clip art matching activity, it’s good especially in level 1. In this case, rather than just doing the matching activity, I will put up the clip art, or my own images found online for these words. I do a little talking/questioning about things related to this vocabulary. So, looking at the first image, it is “maestro”. Since I use “Profe” in class, I will mention that maestro = profe, and then talk about teachers at my school. “¿Cómo se llama un maestro de arte?” I might ask if they are good teachers, or if they are strict teachers, or if they are crazy teachers. As much as I think students will easily understand so they can hear the word “maestro” without me being boring and repetitive. Lather, rinse, repeat with the other words. Because I love reading in class, and because I love holding off on the big reveal of the video, I would then read the embedded reading. Because this could be one of the very first readings they do in Spanish, we will go through and as a class say what it means in English. I don’t say we’re going to “translate” it, because I want to avoid word-by-word translation. I want to get at the meaning of the story. And we are going to start with the 2nd reading, the “Versión Pequeña”. You will see why later. How do I do this? Justin y su amigo van a la clase. Justin le pregunta al profe: — ¿Puedo ir al baño? (By this point in the story, they’d be able to guess what Justin says. I’d just ask them to predict how “pregunta” and “dice” are different. I often accompany the word “pregunta” with a giant question mark in the air. And often a sound effect. For a glimpse of this, watch Victor Borge’s Phonetic Pronunciation video. Or, just watch it because it’s funny. Warm Up: I would have students read the reduced version (the shortest one) of the embedded reading. The great thing about embedded readings is that the text from one version is embedded into the next longer version. So having read the 2nd one in class together yesterday, the 1st one should be more comprehensible. They would write a summary. Yes, they already know it. Yes, they probably have yesterday’s story with the answers on it. I don’t care. I just want them reading the words. FINALLY, I show the video. I might do some pause and talk moments during the intro especially. But I’ll let the song play. 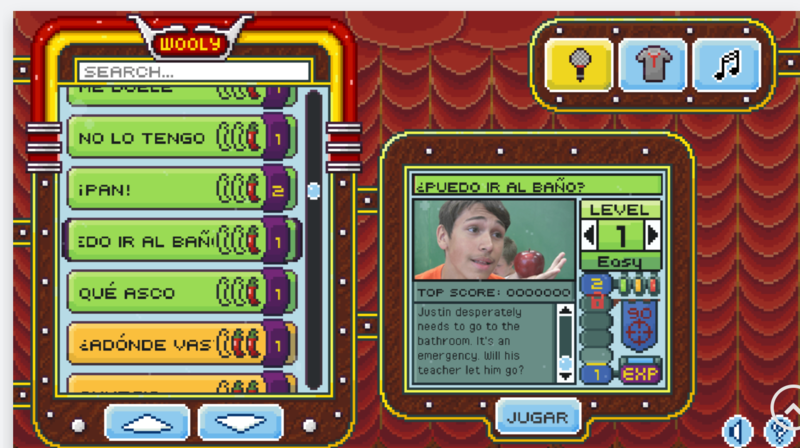 In level 1 they watch with both English and Spanish subtitles. And then that’s it for day 2. Always leave ’em wanting more, right? Yep, I drag these out for about a week. So we’re about halfway through. Today I would give them some true/false sentences about the video which we will discuss. “T/F–Justin necesita ir a Target”. “T/F–El profe tiene mucho pelo”. Whatever makes sense that they’ll understand. We will watch the video again. THIS time, I will be annoying and stop it about every 6 seconds so that I can give even more comprehensible input and conversation about EVERYTHING that happens or can be seen in the video. Yes, this is annoying. Too bad. I bet their math classes have annoying things that happen too. And English. And social studies. They can deal. Embrace the fact that you are probably going to frustrate them. Before they are totally over how awesome this song and its video are, we will start in on the nuggets. I typically give them about a week to complete any online assignment, since not all my students have internet access all the time. We are on our way to being a 1:1 school but in the meantime I have a chromebook cart in my room, so pretty easy access to the technology to do these things in class. For this first one, I will assign them to complete Nugget 3, and give about 30 minutes to work on it. We have Dyknow at school so I can block all other sites from their Chromebooks and see who is on-task and who is goofing around. I would set all my level 1 kids to the Novice Low level early in the year, but later would allow kids to request a “bump up” to more complex tasks. Some kids I just bump up during the year anyhow, because I know they’re ready. Today I will probably pirate one of the nugget activities, such as the one pictured below to use as a warm-up. I would choose one from later in the nuggets that they haven’t seen yet. This is Nugget 9, Read & Review. I’d reformat it so that I could have a couple of questions on the screen as the warm-up. Because I’m doing other things in class besides this song, we probably won’t spend as much time on it today as we did yesterday…remember, I’ve got a 90-minute block. I would probably just show the video one more time, maybe with pop-ups as a treat. Sometimes we sing the song, with different groups being responsible for singing different parts of the song. That depends on the class. Since I do this quite early in the year, some classes aren’t ready for the locura that is life in my room. What about homework? 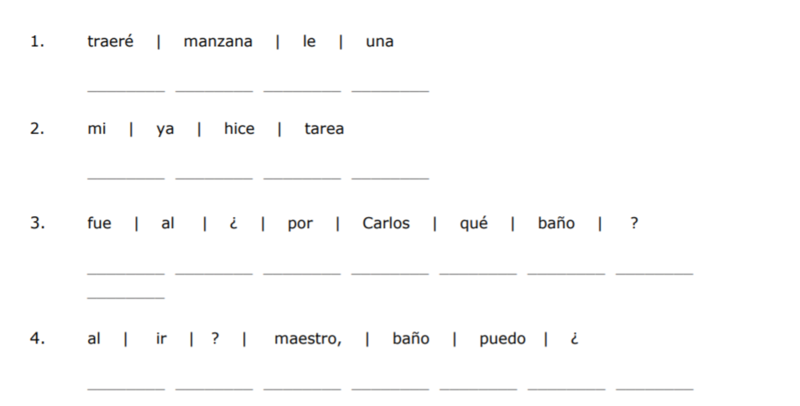 I would give kids copies of the remaining embedded readings and assign a “ROBERTO”…an idea I got from Jorge Perez de Jesus. ROBERTO means “Read Or BE Read TO”. They need to read the long version of the story to an adult and have that person sign the page, or take a selfie with that adult and the reading and send it to me. But the medium and extended versions are on the sheet. I let them know that they can do one of the other versions, secretly hoping they will choose the long ones to show off to their parents…and make ME look good in the process! Mwa-ha-ha! 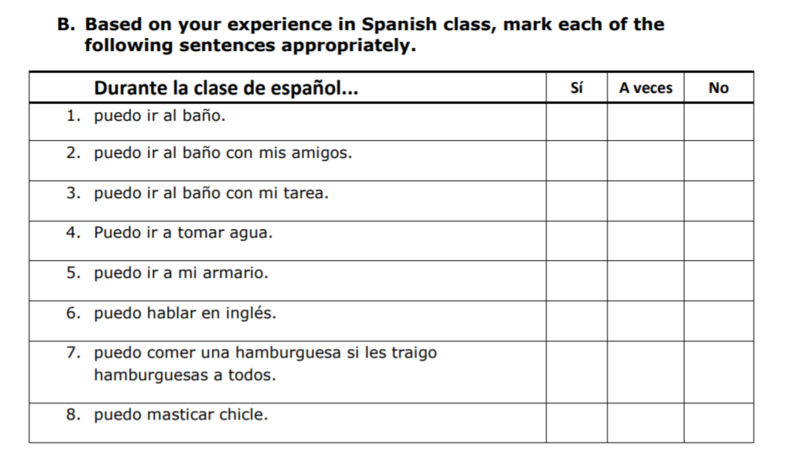 Our warm-up today could be the “translate” activity from the supplement packet. We might listen to the song today as a class, just for a quick review. If I haven’t shown the pop-ups, they will see that version today. 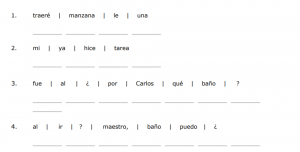 Then, I often retype these scrambled sentences from the supplement packet into SMART Notebook so kids can physically move them around and create the lines of the song. This could also be easily done on pieces of paper. I would color code each line so that they keep lyrics from each line separate. Or don’t…that could be an added challenge especially for higher level students, or those who have heard the song before in previous classes. As they say, Your Mileage May Vary (YMMV). This is a fairly typical week of me approaching a Sr. Wooly song. This is NOT how I do every song. I don’t spend this much time on all songs. 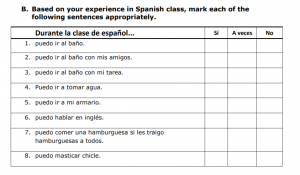 Others really connect with my students and we do WAY more in terms of extension activities, because if kids really get into something, I want to run with it. But as they say in theater (or is it “theatre”? ), always leave them wanting more. If you beat a song to death, kids are NOT going to spend a lot of time outside of class obsessing on the song, doing the videogame just for fun. Sometimes, less is more.